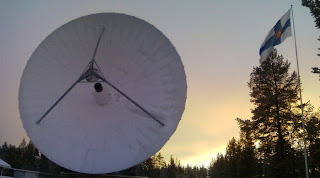 Today's photograph features the Finnish State Flag flying beside the EISCAT 32m dish at Sodankylä. Finland has quite a few "flag days", when it is customary to fly the national flag. This particular photograph was taken on 24th October 2012, and the flag had been hoisted for United Nations day.